Africa's the place and Ace is on the case, setting out to rescue an animal he loathes - a bat! Jim Carrey returns as Ace, the alligator-wrasslin', elephant-calling, monkeyshining, loogie-launching, burning coals-crossing, disguise-mastering pet detective. If you're ready to laugh like a pack of hyenas, if you want more fun than an industrial-sized barrel of monkeys, you know what to do. Heed the call. $37.804 million on -unknown- screens. 1995’s Ace Ventura When Nature Calls hit movie screens less than two years after the initial release of Ace Ventura Pet Detective, but it found Jim Carrey at a very different place in his career. When Pet struck, he was just another TV ensemble member trying to leap to the big screen. By the end of 1995, though, Carrey’d appeared in four straight box office smashes and was an established star. Calls became a hit as well, though I think it made its money on momentum more than quality. Calls reintroduces pet detective Ace (Carrey) on a sour note. When he attempts to rescue a raccoon stranded on a mountaintop, things go wrong. This leaves Ace a “broken man” who retreats to a Buddhist monastery. Into this setting comes Fulton Greenwall (Ian McNeice), an agent of British diplomat Vincent Cadby (Simon Callow) who hopes to recruit Ace. Something happened to the sacred bat of the African Wachati tribe, and if they don’t recover it, the Wachootoos will attack the Wachatis since the animal was meant as a wedding dowry. Ace gets to know the Wachatis and investigates the crime. Alleged hilarity ensues. Although I strongly disliked Pet Detective, I held out some hope that Calls might be watchable. This seems illogical, but occasionally I find sequels to bad movies that outdo their predecessors. If Calls entertained me, it wouldn’t be without precedent. Unfortunately, Calls failed to improve upon the irritating model set up by Pet. Actually, it shows some life in its early moments. The segment with the raccoon acts as a fun little spoof of 1993’s Cliffhanger, and that gave me some hope the movie might show greater cleverness than its insipid predecessor. After that promising start, however, Calls rapidly degenerates into the same obnoxious style of humor that dominated Pet Detective. The new setting stands as the main thing that differentiates the two. Actually, I suppose Ace’s newfound spirituality creates something new as well, and this one lacks the love interest represented by Courtney Cox in the original. Whereas Pet Detective appeared to take Eighties flicks like Beverly Hills Cop as its inspiration, Calls goes back farther for its influences. It borrows from the comedies of the Thirties and Forties. You half expect to see Laurel and Hardy show up in this comic farce. This influence doesn’t mean that Calls will live up to earlier classics, though, especially since it brings a very Nineties sense of gross-out comedy. There’s plenty of vulgarity to be found here, and those elements don’t mesh with the throwback qualities found elsewhere. Calls also adds a very Nineties feeling of political correctness. It makes Ace more of an animal rights activist who protests trophy hunting and the wearing of fur. Hey, I’m right there with them, as I denounce those activities as well. I don’t like the heavy-handed way in which the film awkwardly tries to integrate these elements, though. They don’t fit the rest of the flick and they feel forced. 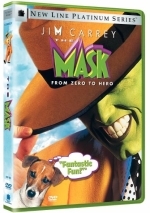 As was the case with the original film, Carrey remains a grating presence. I think he decreases his mugging, but the movie makes him out to be even more obnoxious. Take the scene in which he and Greenwall drive to the consulate. Ace goes out of control as he trashes the vehicle and generally acts like an idiot. I guess the recklessness is meant to amuse and entertain us, but those moments just look stupid instead. The same goes for much of When Nature Calls. I probably enjoyed it more than I did Pet Detective, if just because I went in with lower expectations. It comes with most of the same flaws, though, and brings out few if any new positives. This is a weak attempt at humor. 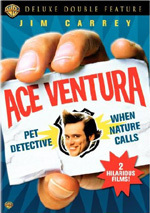 Ace Ventura When Nature Calls appears in an aspect ratio of approximately 1.85:1 on this single-sided, double-layered DVD; the image has been enhanced for 16X9 televisions. For its first-ever widescreen DVD presentation, the movie came with a surprisingly super transfer. Virtually no problems affected sharpness, as even wide shots stayed nicely crisp and well-defined. The film consistently looked concise and accurate. Jagged edges and shimmering were absent, and I also failed to detect any edge enhancement. Source flaws created no concerns. A few early scenes showed a little grain, but that was the closest thing to a distraction. Otherwise the flick was clean and smooth. With its African setting, Calls boasted a vivid palette. Lots of lively hues manifested themselves in this vibrant flick, and they always looked great. Blacks seemed deep and rich, while shadows showed good clarity and smoothness. I felt very pleased with this strong image. In addition, the audio of Calls was nearly as good. As with Pet Detective, the sequel offered both Dolby Digital 5.1 and DTS 5.1 soundtracks. As with Pet Detective, the two mixes sounded very similar. The DTS version was a little louder, but otherwise I didn’t notice any variations. Unlike Pet Detective, the soundtracks of Calls were very good. I thought the audio of the first film showed lots of problems, but none of those repeated for the sequel. Quality was consistently excellent. Speech remained concise and crisp, and I noticed no edginess or other problems. Music showed nice range and definition, while effects seemed detailed and clear. Bass response was warm and deep at all times. The movie’s soundfield also came across as strong. Music displayed nice stereo definition, and the African exteriors allowed for the track to open up matters nicely. All the action sequences used the spectrum well and placed us in the various environments. The surrounds brought us into the material in a vivid way, and we got good stereo elements from the rear when appropriate. All in all, the mixes packed a good punch. Not too many extras appear on the Calls disc. In addition to the film’s trailer, we get three vintage TV spots. None of these are terribly interesting. Since this edition of Calls can be bought only as part of a three-disc “Ace Ventura Deluxe Double Feature”, I thought I should mention the third platter as part of my review here as well as with the original movie. That DVD includes three episodes of an animated Ace series that aired in the mid-Nineties. We find “The Reindeer Hunter”, “Natural Born Koalas”, and “Dragon Guy”. These are a little edgier than the typical Saturday morning fare, and Michael Hall does a decent impression of Jim Carrey. (None of the original voice cast appears here.) The shows aren’t great, but they’re no worse than the source material. Live-action Ace is already cartoony, so he transitions fine to animation. I wasn’t particularly entertained by the shows, but they were watchable. Ace Ventura When Nature Calls may not be quite as irritating as the original, but that doesn’t make it much of an improvement. It comes packed with predictable, obvious and lame gags as it rarely manages to entertain. The DVD offers very strong picture and audio but lacks substantial extras. Still, it represents the movie well, and since Warner sells it at a great “double feature” price, I recommend it to fans. I can’t endorse any form of “blind buy” for this clunker, though; if you don’t already love it, avoid Calls.